A-Boards and A-Frames are the most widely and commonly used street side advertising display. Easy to set up, and can be folded away for convenient storage. The solid durable frame is ideal for outdoor usage, and allows for interchangeable artwork meaning you can update your designs throughout the year. 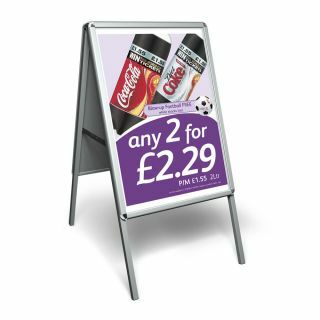 Supplied with high quality printed poster paper which can be easily fitted into the frame, providing you with an affordable and professional looking pavement display. Is the printed graphic supplied with the A-Board frame? Yes, our A-Boards are supplied with printed artwork as standard. Can I change the graphics in the A-Board? Yes, the A-Boards are designed to allow you to easily replace the graphics allowing you to get the most out of the frame. Can you print replacement graphics for the A-Boards? Yes, if you already have already purchased an A-Board from us in the past we can help you with replacement graphics for your frame. Note if you have an A-Board that was purchased from someone else, please check sizing as it may differ slightly from the frames we stock.